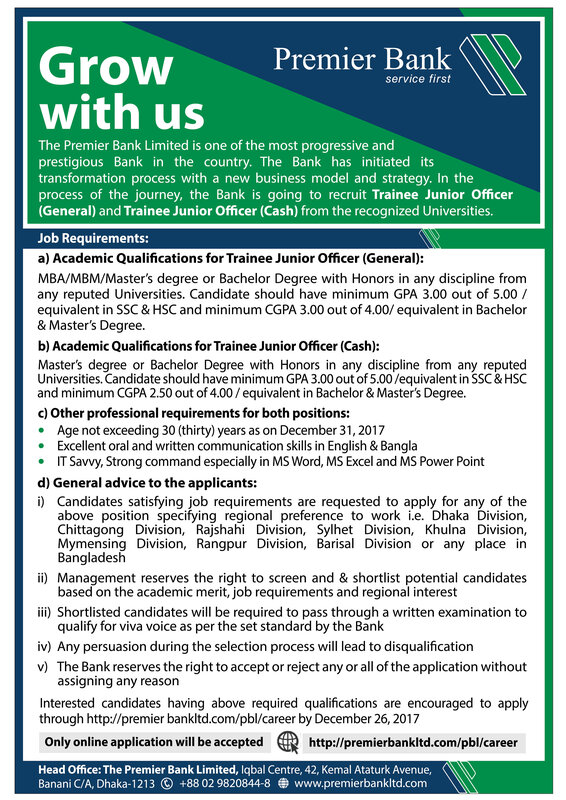 Premier Bank Limited Job Circular 2018. PBL Premier Bank Ltd. Career Result 2018. www.premierbankltd.com e-Recruitment System, Written Viva Selection Procedures & Question Solution 2018 published on some Daily Newspaper, official website and Application process maintain by the http://premierbankltd.com/pbl/careers/ on this post you will find Premier Bank all Circular in all position. If you want to get Premier Bank connected all info found in our web site ReadingBD.com. To support its continuous business growth, Premier Bank is presently probing for formidable, smart, goal-oriented, warm people for different position. Premier Bank Limited Job Circular 2018 given below. The Premier Bank Limited (PBL) is one of the most progressive Bank in the country. The Bank has initiated its transformation process with a new business model and strategy. As a part of the journey, the bank is looking for talented, young and energetic individuals to join its Management Team as a Management Trainee Officer (MTO). PBL defines MTO’s as high potential fresh post-graduates who usually are quick learners and intellectually bright with the capability to meet targets and produce effective results. They expected to demonstrate leadership qualities to progress in the future Management positions at PBL. IT Savvy, Strong command especially in MS Word, MS Excel and MS Power Point. Age not exceeding 30 (thirty) years as on 01.10.2018. Must be an extrovert and willing to work in any location In Bangladesh. Interested candidates having above required qualifications encouraged to apply through http://premierbankltd.com/pb1/careers. Application deadline: __ November 2018. Only online application will accepted. The selected candidates will appointed as MTO and they will on probation for a period of 01 (one) year. During the 01 (one) year Probation Period, a MTO will paid a monthly consolidated salary of Tic 45,500, (forty five thousand and five hundred) only. After successful completion of probation period they will absorbed as Senior Officer with a salary of Tk. 54,300. The applicants should have to submit the original/provisional certificates and mark sheets at the time of final selection. Any persuasion during the selection process will lead to the disqualification of the candidature. Only short listed candidates will called for written test and subsequent interview before final selection. Final selection of the candidate is the discretion of the Management of The Premier Bank Limited. Willing to accept any challenges and take charge with a “Can Do” attitude. High on energy and enthusiastic to ensure quality of service to our customers. Innovative and have a problem solving mindset. Upholds business ethics and integrity at workplace. People, who can and are willing to make a difference, may apply in response to the various openings in the Bank. When the authority Update any kind of information about Premier Bank Limited Job Circular 2018, We will update here. For more Bank Jobs like our Facebook Fan Page and get update any kinds of job.